The last native speaker of the tiny Livonian language died three years ago, and so one might think that Livonian is now an extinct language. But if the language is extinct, how come you can listen to folk songs on YouTube? How can you attend summer camps to learn it? The Livonian community, its local and foreign supporters and the very few who speak it as a second or third language are trying to help it survive; even if it will not retain a traditional function of a language – to be a primary communication tool for its speakers – the culture might still prevail. 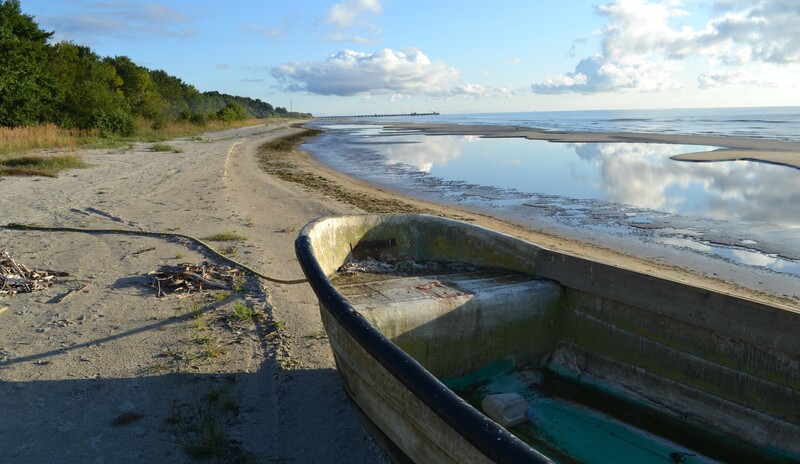 The north-west corner of Latvia, the so-called Livonian coast, is the home of a nation struggling to survive. If you want to meet Livonian people, you can visit one of the twelve villages on the Baltic coastline where they have lived for centuries. But now many of them live in cities, and no longer speak their ancestral tongue. Today only around 200 people identify themselves as Livs, and the language of these people is almost forgotten. There are no native speakers left – can a language survive if only enthusiastic activists and linguists speak it? The Livonian language is related to Estonian, Finnish, Hungarian, and other Finno-Ugric languages. In fact, even present-day Livonian has many words that are immediately recognisable to Estonian speakers, and the Livonian language shares even more similarities with the Southern Estonian dialects spoken in Latvia, about which Deep Baltic has already written. The few remaining speakers of Livonian learned it as their second or third language. While estimations as to how many speakers there are differ, there are certainly no more than a handful with any level of fluency. For linguists, this is an extremely interesting case, as it is hard to imagine many other cases where a single scientist could interview half of the speakers of a language. But the ever-dwindling numbers of speakers, native or not, indicates a grim outcome for the survival of the language in future decades. The Livonian people have lived in the territory of present-day Latvia for centuries, if not millennia. The region comprising what is now Southern Estonia and Northern Latvia was historically called Livonia, named after this nation, suggesting that they inhabited a more significant territory before they slowly assimilated into the Latvian population. The Liv people prospered due to strong economic development in the 10th-13th centuries before Christianity arrived to the Baltics; theirs was an oral culture, without a written language. Livs were a minority for centuries, and evidence suggests that even as early as the 13th century they composed only 20% of the inhabitants of the region. As a result, bilingualism was widespread and the language was heavily influenced by Latvian, not only on the level of vocabulary, but also phonetics and grammar, such as the dative and instrumental case of Livonian. But linguistic impact was never unidirectional: Latvian displays a strong influence from Livonian as well: for example, the emphasis on the first syllable, as Valts Ernštreits recently revealed to us. The prevalence of Latin and later German-language texts across the Baltic meant written vernacular Latvian and Livonian appeared only sporadically, such as place names and other words, and it is not possible to create a separate “Livonian history”. As a result of the Christian reformation promoting a singular, personal relationship with God, vernacular languages were used in religious services and texts, thus stimulating the standardisation of languages and spread of literacy throughout the Baltics and other parts of Europe. Some written sources mentioned Livonian and Latvian books which were seized and destroyed by authorities, but none of these old texts have survived. Since Livonians were a minority both in the Latvian part of Livland (Vidzeme) and in Courland (Kurzeme) region, these cultural developments strengthened Latvian influence in educational, religious and cultural life. The translation of religious texts to vernacular Estonian and Latvian started taking place as early as the sixteenth century, but in Livonian it happened three hundred years later, in the mid-nineteenth century, by which time only a few thousand speakers remained in Kurzeme; while in Vidzeme, Livonians were already deeply immersed in a bilingual environment. As early as the seventeenth century, the Swedish writer Burens claimed that Livonian was practically an extinct language. From that perspective, it is almost a miracle that the language survived at all. The written form of Livonian started to be formalised in the early twentieth century, and the first grammar books and linguistic research of late nineteenth century was carried out by non-Livonians, mostly Finns or Estonians. In the late nineteenth century the cultural and scientific development of the bigger Finno-Ugric nations made it possible to preserve the Livonian language. The linguists Andreas Johan Sjögren (Finnish) and Ferdinand Johann Wiedemann (Estonian) compiled the first dictionary in 1861, which was published in St. Petersburg. It is worth noting that written Livonian was developed based on the dialect spoken in Kurzeme (although the differences within Kurzeme dialects have also resulted in various standardised forms). Moreover, not all Livonian language books were of much use to Livonians themselves: One of the first books published in Livonian, the Gospel of Matthew published in London in 1863 and appeared in two different dialects. Only one copy of each publication was received by Livonians. Hungarian academics joined the network of Livonian-supporters through Finnish researchers at the end of the nineteenth century. In a Hungarian context the Northern and Eastern “brothers and sisters” of other Finno-Ugric nations were further away (both geographically and linguistically) than for the Finns or Estonians. The network and cooperation of Finnish and Hungarian academics, ethnographers and researchers has existed for decades. The Finnish Emil Setälä has presented the case of Livonians at the Hungarian Academy of Science in 1889 as a small, endangered nation of relatives. At this time, neither Finland nor Hungary were sovereign states, but Hungarians joined into this ethnographic and scientific endeavour through Finns, as Livonian activism was too small to reach out to foreign “relatives”. With Finnish and Estonian academics as key supporter of Livonian movements, Helsinki and Tartu have remained important centres for preserving Livonian culture and language today, although there are considerably fewer connections to the Hungarians. Without the contributions of these distant relatives, the complete assimilation of the Livs into the Latvian nation would have taken place much earlier. The modern Livonian writing system was developed only in the 1920s, and not surprisingly, displays a heavy Latvian influence; most Livonian speakers of this time period had formal education in Latvian. The marking of the length of vowels in Livonian is similar to Latvian, indicated with a macron such as “ī” or “ū” (not “ii” or “uu”, as in Estonian or Finnish). The marking of palatalised consonants also follows the logic of Latvian orthography such as “ļ” or “ņ” letters. Yet, the Estonian writing system also influenced Livonian, including with the distinctive Estonian letter “õ”, which is still used in Livonian writing. The first decades of Latvian independence fostered a blooming cultural life, in which Livonian cultural associations became active and even some level of education was possible. Even though for centuries Livonians had been engaged in various occupations – agriculture, fishing and trade – by the time the Livonian movement appeared the language and culture survived only in the coastal fishing villages, and therefore the Livonian “fisherman” identity became one of the cornerstones of Livonian identity. What is perceived as the Livonian material culture is also connected to fishing, as what remained for Livonian speaking communities was a somewhat distinct culture. The institutionalisation of Livonian cultural life took place rapidly after Latvian independence. The Livonian Society (Livõd Īt) was established in 1923 in the Lutheran Church of Mazirbe. The Livonian national flag was created the same year. The green-white-blue tricolour symbolised the Livonian lifestyle: as Liv fishermen look to the shore from the sea they see the green woods, the white sands and the blue sea. The Livonian national anthem was written to the same melody as the Finnish and Estonian anthems. Soon the Livonian cultural house opened in the village of Mazirbe (Irē in Livonian) with the support of the Estonian, Finnish and Hungarian states. As a result of the lack of a sizeable number of “consumers” for these cultural products, the Livonian community relied heavily on outside donors. This was a time when Finland and Estonia, as newly independent countries, had more possibilities to help Livs and other small “relatives”. At the fourth Finno-Ugric Congress held in 1931 in Helsinki, the Livonian delegation asked for the help of “bigger and stronger brother nations”. For these newly established nation states, these cultural endeavours were of the utmost importance for strengthening their own national identities. In an era when the idea of different national characteristics was widely discussed and believed to be influential, helping distant, oppressed and weak kinfolk was like a form of nationalistic charity. Līvli, the first Livonian-language journal, appeared in 1931. Institutionalised education in Livonian had begun in 1923, but only as a separate subject, taught once a week in Latvian-language village schools. The five teachers who taught the language had received their education in Finland. And this brings us to the core of understanding and analysing a function of a language and its role in a modern society. Despite earnest efforts of the interwar era, the language was already doomed, relegated only to a few spheres of life. While the language was a fundamental carrier of cultural heritage and traditions, it was not the most important or widespread mean of communication. The cultural project of saving the Livonian people and their way of life was not a political project, and thus remained marginalised; given the fact that it relied very much on foreign donors, it was not a nationalist project as such, but rather an ethnographic project to ensure the survival of the nation. The personal stories of the last native speakers of Livonian are perfect examples which reflect the history of Baltic people in the twentieth century. During the First World War the Livonian coast was a strategically important battlefield, and most residents were forced to flee their homes. Not all of them returned. After World War II, many of the remaining Livs were sent to Siberia. As the literal Western borderland of the Soviet Union, their native homeland was heavily militarised, and the means and equipment of their traditional occupation of fishing was banned. Their language was not in use anymore. Many of the speakers moved to Riga or elsewhere. The last native speaker of Livonian living in the traditional Livonian territories, Viktor Berthold, died in 2009. Grizelda Marija Kristiņa, thought to be the last native speaker of Livonian, lived only a few years longer; she died in Canada in 2013. With glasnost and the restoration of Baltic independence, the purpose of Livonian changed for its users. Most native speakers had died, and the ones still alive in their old age lived in mixed families. People who wanted to use the language were almost entirely native Latvian speakers, so its use was restricted to cultural realms, such as choirs. Here, again, the function was not direct communication. The Latvian state recognised Livonian as a historic nation in 1991, and finally, Livonian cultural life received significant support from the state where they live. Soon new segments of Livonian life were reorganised. Language education for children and adults appeared again, such as the yearly summer language camps in Mazirbe, which are organised for kids to help them learn the language of their ancestors. Yet this type of education has its limits: if most of the year the kids are not in connection with the language, and the teachers themselves have a limited knowledge of the taught language. For adult education, the lack of teachers and learning materials makes it harder to organise formal language courses, yet it has happened several times in the past decades. Livonian courses are available to students of Finno-Ugric studies in Riga and Tartu, but linguistic study of a language is quite different from learning it for colloquial use. The internet has helped to make Livonian music and culture more accessible to a wider public. Among others, the Stalti Family and the Estonian-Livonian band Tuļļi Lum have recorded folk music in the Livonian language. Today, the Livonian Union runs various activities in Kolka, Mazirbe, Ventspils and Riga. The summer months are more lively in the coastal villages and in the community house of Mazirbe, with artists, musicians and others interested in the activities. As Ieva Ernštreite the president of Livonian Union, told us, everyone in the Livonian Union is a volunteer, and their office is her flat in Riga. Separately from these organisations, the municipality of Riga organises family-oriented Livonian Days once a month to present Livonian cultural heritage to the residents of the Latvian capital. The past years have witnessed many successful events: 2011 was the official year of Livonian language and culture. A hundred and fifty years after the publishing of the first dictionary in the language, and 90 years after the publication of the first reader (Līvõd ežmi lugdõbrōntõz) the Livs and supporters of Liv culture have reasons to be optimistic. The programme for the year included conferences and the publication of new books in Estonia and Latvia. The internet has provided a useful tool for Livonians: Livones.net provides information about the language, history and current activities of Livs in English, Livonian and Latvian. All these efforts of Facebook pages for helping to learn words, or YouTube channels are great tools to engage people so that they stay in touch with the Livonian language and sustain interest. Since the Livonian language and culture has been teetering on the edge of extinction for centuries, the possibility of a re-established and thriving Livonian-speaking community may seem fantastical. However, if there is active engagement from the few remaining ethnic Livs, as well as outside support, the Livonian heritage will undoubtedly survive, although perhaps not in the way we might expect. Roland Papp was born and raised in Budapest. After studying linguistics and Central and Eastern European History, he lived in Estonia. Now he is a blogger and also works for EU institutions. Andrejs Plakans: The Latvians: A Short History, Hoover Institution Press, Stanford University , 1995, p 39. Valts Ernštreits. “Livonian Orthography”. Linguistica Uralica 1:11-22. p 14. Nicely written and illustrated. I wonder if you could find some information about the first video, “The Livonian language” – who is the woman portrayed, who made the video, when? This info is also missing in Youtube. I guess the material comes from the Oral History Archive, but I could not find it on their web page (dzivesstasts.lv). Pingback: Czy można przywrócić do życia wymarły język Liwów?